In February, I was fortunate to be in Edinburgh for the launch of a new labyrinth book and to experience a wonderful labyrinth light projection made by labyrinth enthusiast and artist Jim Buchanan. The venue was Old Saint Paul’s church, magnificently dark and dim, with just a few sparsely placed candles twinkling in the gloom. The book to be launched was Working with the Labyrinth, edited by Di Williams, Jan Sellers and Ruth Sewell, and published by Wild Goose Press. The light artist Jim Buchanan has contributed a chapter on his work with labyrinths, and there are stories to inform and inspire from many other contributors. 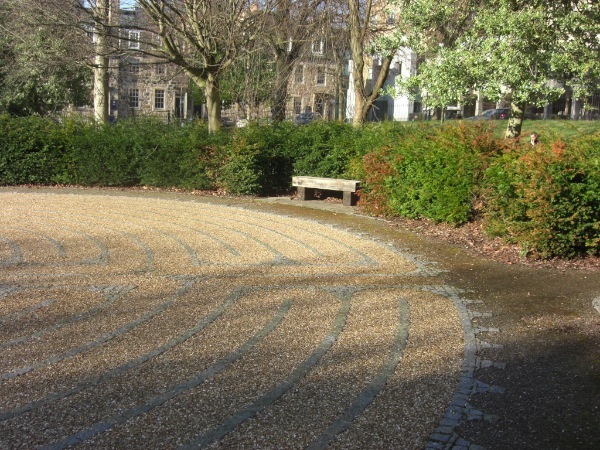 Next morning I went with Jan to visit the beautiful Chartres style labyrinth in George Square. As I paused in each of the six petals of the centre I reflected on peace of heart, calm in the storm, and the pilgrim journey of life. I was also happy to see an old friend, a robin, hopping around in the surrounding yew hedge near the labyrinth entrance. Whenever I encounter a robin, I remember one morning a couple of years ago when a robin flew into my bedroom through an open window. This robin stayed a while, looking most unconcerned, hopping from dressing table to bookshelf and back. I’d woken that morning feeling distressed by confrontations going on in my life. Intrigued by my visitor, I looked up the traditional symbolism of the robin, in our own and North American indigenous culture. Just as I guessed, I found what I needed to hear that day. The robin teaches us to disarm our adversaries and mark our boundaries, not with fights and disagreements, but with the supremely positive forces of creativity and song. Last stop on my labyrinth tour of Edinburgh was the Emmaus House Community, who gave us a wonderfully warm welcome. 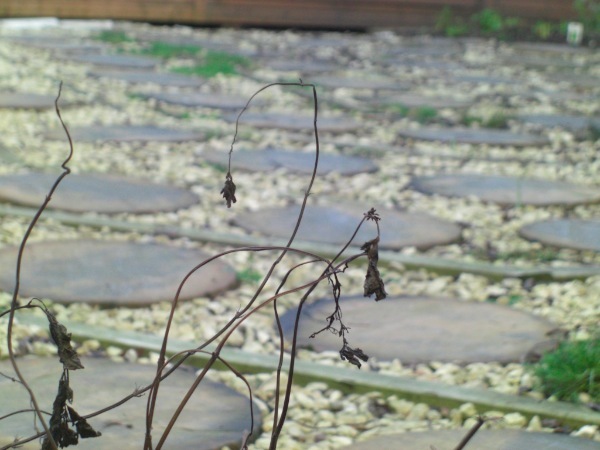 Jan and I visited their lovely backyard labyrinth made of round stepping stones on gravel chips, interspersed with alpine herbs. After our labyrinth walk we enjoyed some peaceful time in the garden chapel and then joined the community in their midday service. We were then made very welcome at a lunch table loaded with good and wholesome things to eat. 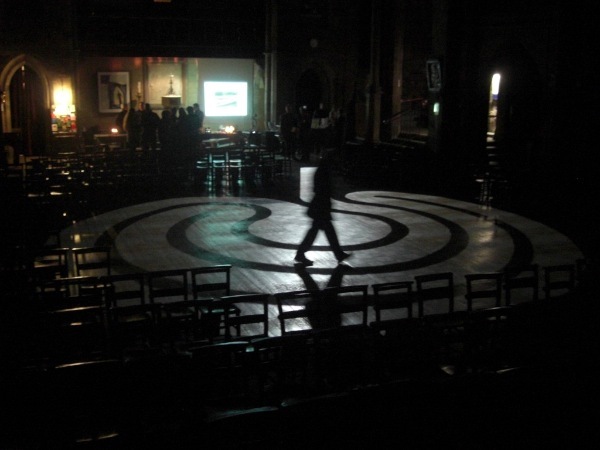 It was a beautiful labyrinth interlude, perfect for brightening the cold days of February. Thanks to Jan for encouraging me to go and to Dave and the family for taking care of things at home. I felt I had slipped into a parallel dimension for a couple of days… Lovely.